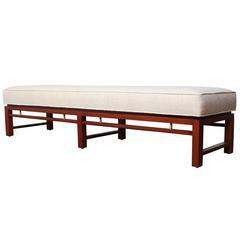 A matching pair of bleached mahogany benches by Edward Wormley for Dunbar. New upholstery. Original finish with minor wear. A bleached mahogany stool with blue velvet upholstery. Designed by Edward Wormley for Dunbar. 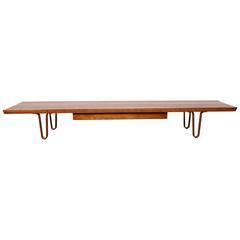 A walnut "Long John" table/bench designed by Edward Wormley for Dunbar. Rare modern small vanity boudoir stool bench designed by Edward Wormley for Dunbar in original upholstery. 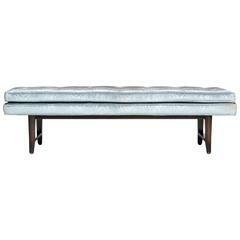 Superb bench by Edward Wormley for Dunbar with Dunbar burned in signature and gold tag. Newly refinished in a deep walnut with new upholstery. COM also available. 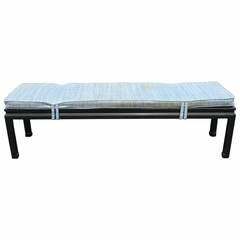 Edward Wormley bench, legs with Asian influence, cushion straps onto the frame, green label, price includes refinishing and upholstery c.o.m. 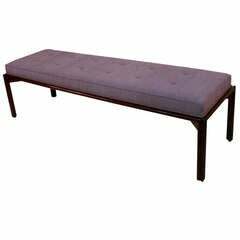 Simple but refined mahogany sculpted base bench by Edward Wormley's Janus line for Dunbar. Newly refinished base with good condition older velvet upholstery, labelled. 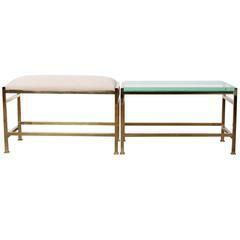 Rare form bench from the "Janus Line" by Edward Wormley for Dunbar. Fully restored, refinished walnut base, and reupholstered in beautiful Great Plaines fabric. 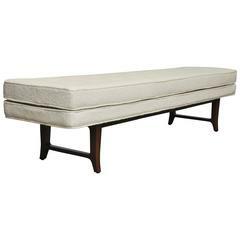 A diminutive and finely detailed low bench having a cut silk button tufted seat floating on a carved and sculptural walnut base.